My year of "firsts" has been rolling along quite nicely. It's been quite an amazing ride so far and I'm checking off my races like crazy. So crazy, I'm backlogged in blogging about them. I've been enjoying summer with my kids, training for my races, and studying for the Praxis like a crazy woman - blogging has taken a little back burner..... I write blog posts in my head daily. But when it comes to getting to my computer and actually typing it out - yeah, that's where I drop the ball! 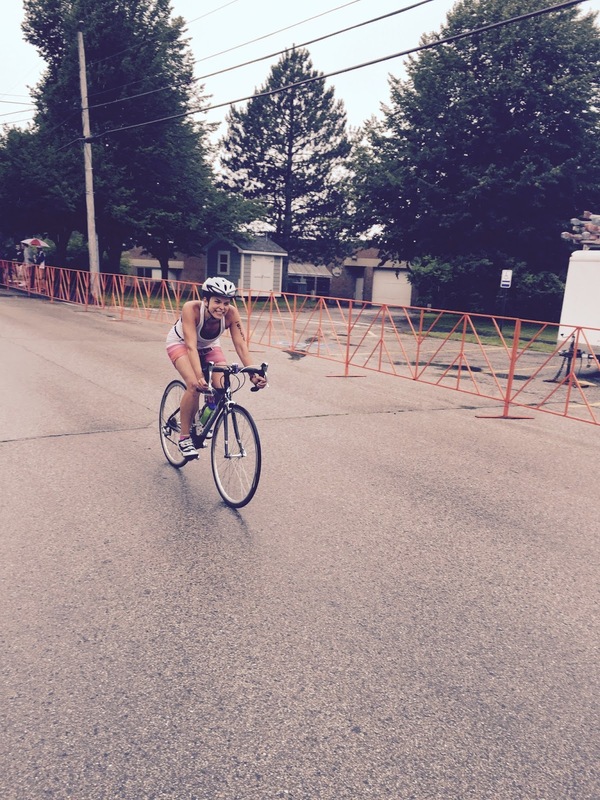 Anyway - I need to tell you all about my first triathlon ever - Tri For A Cure! If you wanted me to summarize it in one word --- emotional. 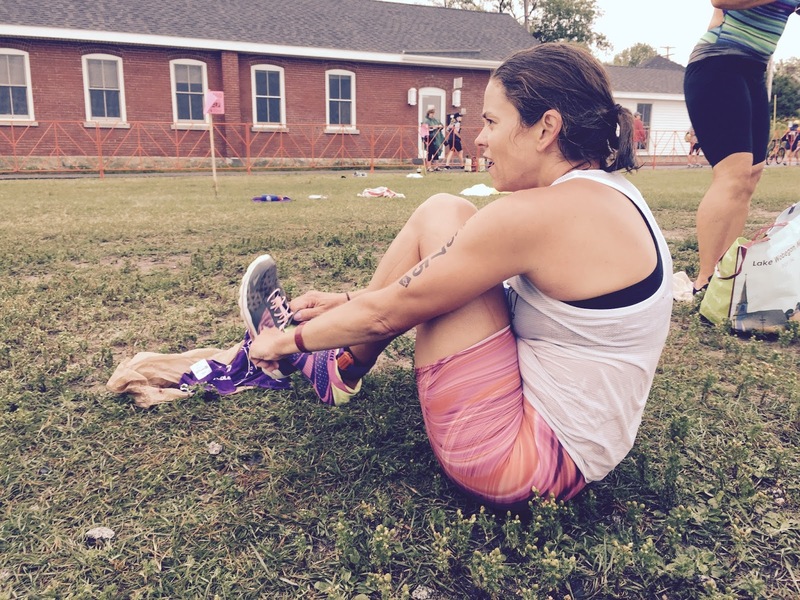 Leading up to the race, my training wasn't very formal or even scheduled. before my first swim lesson.... a little freaked out. Swimming: Thankfully I found a spectacular Tri Training Group with my friend Amy at a local lake. I was super lucky to make a few great friends. The swim instructor ROCKED. She was super patient with me and let's say - I needed a lot of help. I still need a lot of help. If you live in the Augusta, Maine area - I strongly suggest you look up Amy Lawson at Kennebec Valley Coaching. The training groups she hosts are beyond amazing and help all levels of athletes. I should have started swimming way back in January. With that said, I started swimming 6 weeks pre-race. (oops!) With that said - my progress went from being winded with one lap to being able to actually do 1/3 mile without stopping (but still super slow). I never mastered putting my face in the water....but that will come. BUT I did it!!! Biking: Until the indoor bike died early June, I had the opportunity to bike whenever I wanted inside. When the bike died, I had to face my fears and pull out the road bike, get it cleaned up and tuned and actually ride outside. I have a pretty solid fear of riding my bike on the road --- cars freak me out. I was also quite scared of clipping into my pedals. But I did conquer both. I got out and did a couple of bricks and felt pretty good about them! seriously surprised by how much I loved these Nike's! Running: I run all of the time. 3 miles really didn't phase me at all. I was just more concerned about the brick part. I showed up in South Portland the day before to receive my packet, visit the expo and rack my bike. It all went rather fast and easy. The expo was quite amazing and way different than so many other races I've been to. 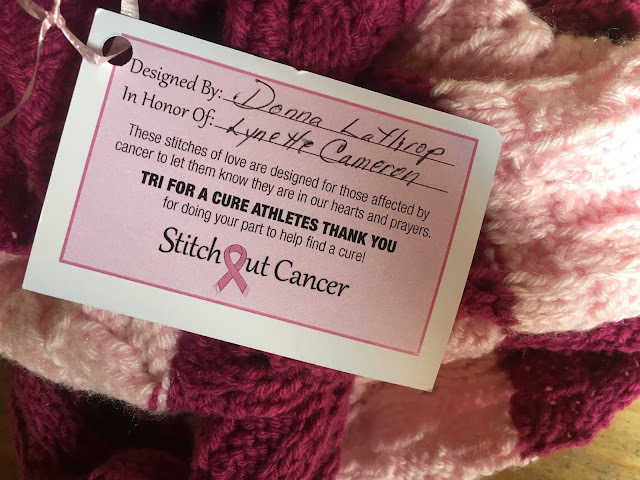 Each athlete received a hand knit scarf made by a lovely lady either in memory of or honor of a cancer survivor. I will cherish and love this scarf forever. I woke up at 4am and was on the road by 4:30 to get to transition by 5:30. It opened at 5:30, but I just needed to get there early to get my mind wrapped around the race. 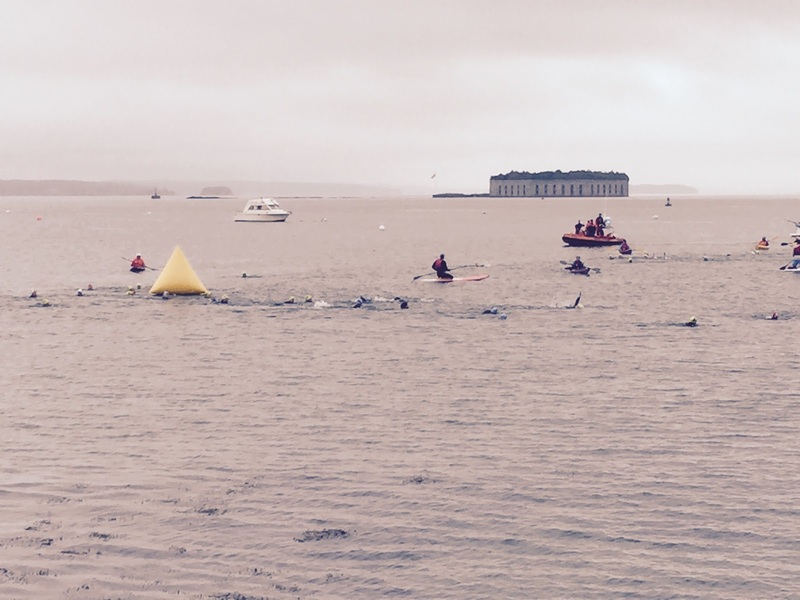 It was rather chilly and rainy - not optimal tri weather, but it wasn't horrible either. I'll take it over 90 degree race days any day. It was a little tricky setting up transition because I didn't want to leave it all out in the rain to be soaked. I know it was going to get wet anyway - but still! So I sorted gear into shopping backs and hoped my plan would work. SOS Rehydrate has been my all time favorite hydration drink! Just before start time, I took a little walk down to mini transition to see the area before it became super crowded and take in the gorgeous lighthouse - remembering why I was there - for my mom, for Carissa, for Victoria, and Janie. Four women I love very much. That's when the tears started flowing. OF COURSE I was running in Spandits! AND OF COURSE I had my Headsweats on! I headed back up to transition for one last bathroom stop, grabbed my super bright, vintage wetsuit, sneakers, and towel and headed back to mini-transition for the race start. The opening ceremony is a celebration of the money raised to fight cancer - while women come together to celebrate life and remember those they have lost to cancer. Again - more tears. It was quite moving and I was proud to be a part of it and had done my part (thanks to the best donors ever) to raise $450. 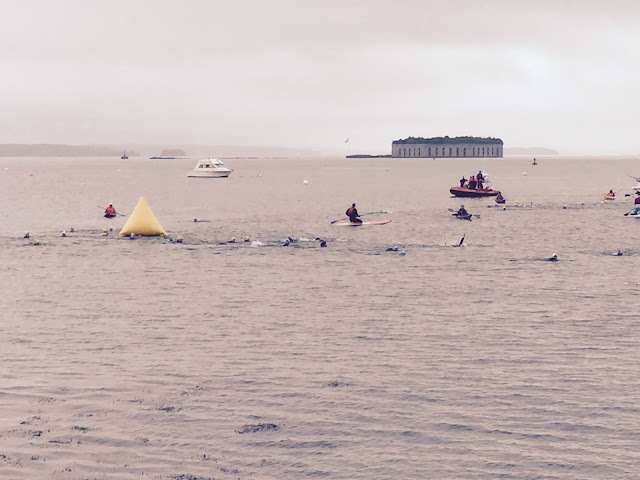 Then they started the waves for the swim- beginning with the survivors (who are beyond strong and amazing), then onto age groups, then novices, then relay. I chose to stay in the novice wave because I had so much anxiety about the swim. 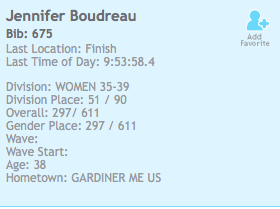 I'm sorta happy I did this because it was near the end and the crowd had cleared out - my family was able to see me swim the entire time...and see me for the bike, run, and finish line easily. The swim was hard. Super hard. I started to panic in the beginning and seriously had to dig deep to get through it. I put my face in the water 1 time. Oops. But I didn't stop and rest at all, I just did it. Slowly. But I did it. this is seriously how close Ward and the kids were to me during transition ---- oh and I see ProCompression socks too! Transition was slow. It's okay. It's my first triathlon! I got to throw my wetsuit to Ward and the kids, change into my sneakers and run up to transition. At transition, I changed out of my sneakers, into my cycling shoes, got my helmet, fuel, and bike and headed to the course. I was stopped by a volunteer because she could hear by back tire dragging. She called over a technician and he checked it out, adjusted it and sent me on my way. The course was gorgeous. It went through some great South Portland and Cape Elizabeth neighborhoods, along the MidWinter Classic and Beach to Beacon courses. It seemed rather weird to be biking these courses. The bike went well. I was only passed by 2 women - one complimented my calves as she passed (then I passed her and thanked her)...and then another woman who had a super serious tri bike. When I came in to transition, I didn't fall over unclipping. Huge success. Changed into my Skechers, grabbed some fuel and water and headed out of for the run. I got to see Ward and the kids again and it made me so happy! I love my family. awful form, I look like I'm dying...by hey - a lighthouse for mom! I had done the run last year when I did this race as part of the relay. The same course - just rainy. I felt pretty strong here and was only passed by one woman - who was completely dry, and then I noticed she was on a relay team. Coming into the finish, I saw my family again. Overjoyed to see them, I sprinted pass them to the finish, got my medal and then rushed off to find them. This was one of the most difficult races I've ever done. It definitely pushed me outside my comfort level - with the swimming and biking, but I'll definitely do it again. and I almost forgot to share! Best FB post the day before... one of my friends happens to live along the bike course...and made signs for her friends in the race! AND she was outside cheering me (and everyone else on too). Awesome feeling! Thank you, Kim!